If you’re looking for a fun reason to get the girls together, look no more! 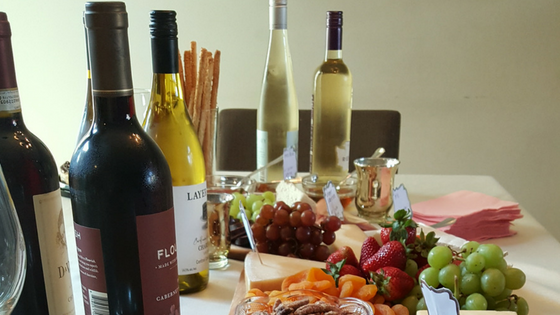 How about hosting a wine & cheese party?! 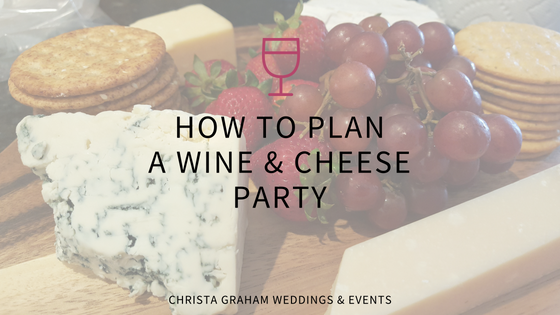 When I decided this was a party I wanted to put together, I knew nothing about pairing wine with cheese! LOL So, I dug into the internets and did a bit of research before making my grocery list. 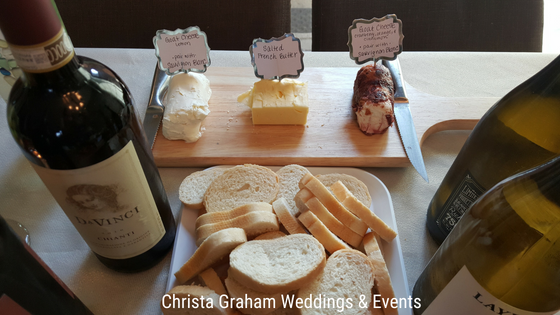 Here is all the information that helped me put together a successful wine & cheese party! The easiest place to start is with the cheese. There are six types of cheeses. I recommend choosing at least one cheese from each of these six types. Choose a variety of staples that appeal to everyone and some unique varieties to give everyone a chance to expand their palettes a bit. And, by all means, if you have a favorite cheese, make sure to include it on your list! Cheese.com lists over 1800 varieties of cheeses from around the world if you need some suggestions! Once you have a list of cheeses, it is a bit easier to research the type of wine pairs well with each. This article from Wine Folly simplifies the process of pairing wine with cheese. Their tips are easy to implement, so I won’t expand on it too much. 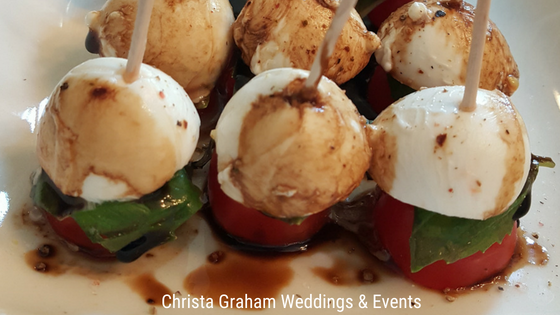 From my experience, your guests will want to experiment with pairing the different cheeses and wines to find their own favorite combination! Choose at least 3 different white wines and 3 different red wines to give your guests a variety. 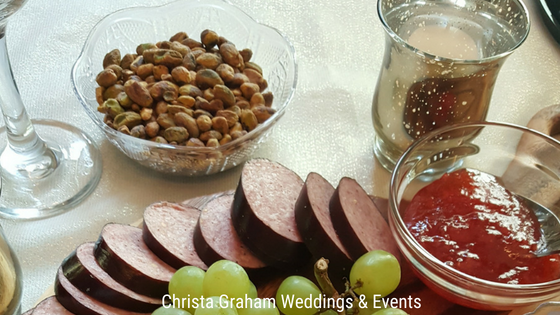 In addition to your cheese and wine, you will want to offer a variety of accompaniments to add to their cheeses. Include at least one accompaniment per type of cheese you are serving. Choose from artisan crackers, cheese straws, crunchy breadsticks, dried fruits and meats, salty nuts, cocoa dusted almonds, fresh strawberries and grapes, jam, honey, tapenade, chutney, and dark chocolate chunks. You can find inexpensive wooden cheeseboards at discount home stores or big box stores. Depending on the size of your cheeseboard, you can fit 2-3 cheeses per board and still have room to nestle in your accompaniments. Use small glass bowls for jams and dips. Finally, votive candles add a touch of sparkle and ambiance to your party! Place the cheeseboards down the center of your dining room table or buffet. Add your cheeses and accompaniments, arranging them so everything is visible and easy to reach. 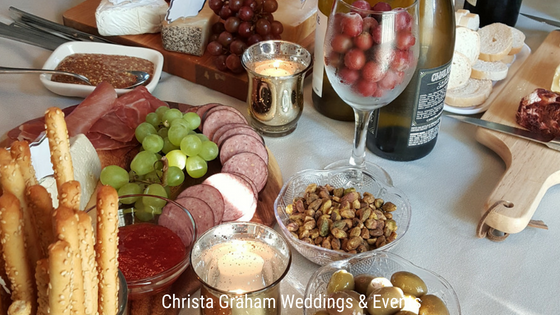 Use place cards or index cards to write the name of each cheese and a wine suggestion to pair with it. You can place the wine bottles among the cheeses or create a separate area in your kitchen for beverages. Whatever flow works best in your space is great! If you have a set of cheese knives, great, but if not, don’t worry. Regular butter knives will work just fine. If you are curious about cheese knives, watch this Marth Stewart video. It will give you a good overview of which knives are for which cheeses. Any good party atmosphere starts with appropriate background music. You don’t have to hire a fancy 3-piece band, though! Simply pair your phone with a Bluetooth speaker and prepare a playlist from your favorite music player. You know your guests best, so choose music that they would all enjoy. Just because you’re getting fancy with wine and cheese doesn’t mean your music has to be stuffy. If your guests enjoy Cardi B, throw her in the mix! Just keep the volume low enough that conversation can still take place. Another resource I used when planning my wine and cheese party is The Simple Guide to Wine & Cheese Pairing from Wine Enthusiast Magazine. It is very comprehensive and informational! Ultimately, here is what I chose to include at my wine and cheese party! If all of this seems like too much work, you always have the option of hiring me to do it for you! I am a party planner working in the Metro Detroit and Ann Arbor areas. 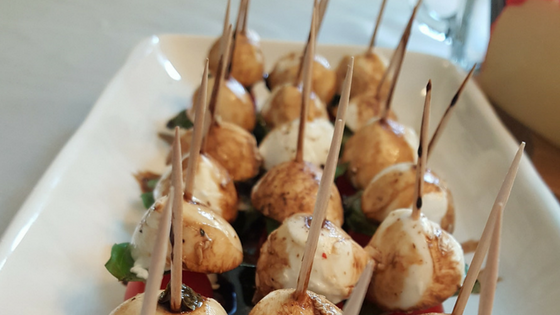 I would be happy to put together a wine and cheese party that is customized for you and your friends. 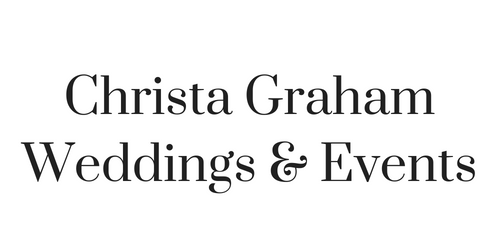 You can find my contact information by clicking here.